"Imagine always believing that men and women were equal," reads a portion of the trailer for a documentary by Silver Bullet Productions. 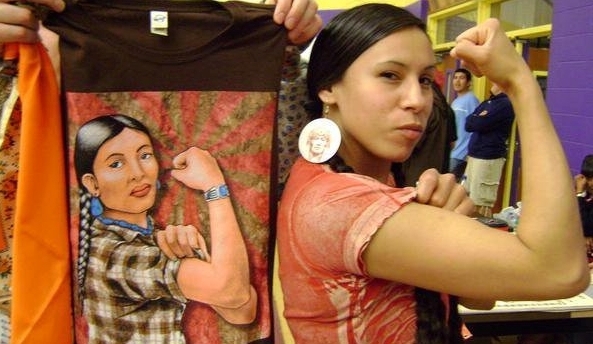 It's a concept Native American women are reclaiming in a the documentary A Thousand Voices. Strong tribal women lead viewers through the history of the invasions of the American Southwest while also explaining how those invasions changed their roles as women. The women in the movie will talk about boarding schools, the reaffirmation of beauty, strength, and sustaining culture and languages of New Mexican tribes. “Each woman tells a story deeply rooted to her culture… and the ‘thousand voices’ that precede her. This eye-opening film shatters stereotypes and features interviews with women from the Navajo Nation, Mescalero Apache Tribe, Jicarilla Apache Tribe, Kiowa Tribe, Pueblo de Cochiti, Ohkay Owingeh, and Pueblos of Acoma, Laguna, Jemez, Santo Domingo, Pojoaque, Santa Clara, Taos, Nambe, and San Ildefonso,” says a press release from Silver Bullet. Responses to "A Thousand Voices: Native Women Correct History, Reclaim Their Power"
I'd love to see this video. Many Native American nations were/are matrilineal. I wish it was that way in the European example. At least we can learn from you! So stand tall, women of Native America, be proud. Help lead the way back to sanity. Wow! Awesome!! We are truly in the realm of what our ancient sacred vision-seekers called "The Eighth Fire" where our people will rise again with renewed hope. I am living to see this vision come to fruition! What an honour! This video is part of that vision. I would love to see this video shown in all elementary schools when they start talking about “American” history. Give the next generation real facts!